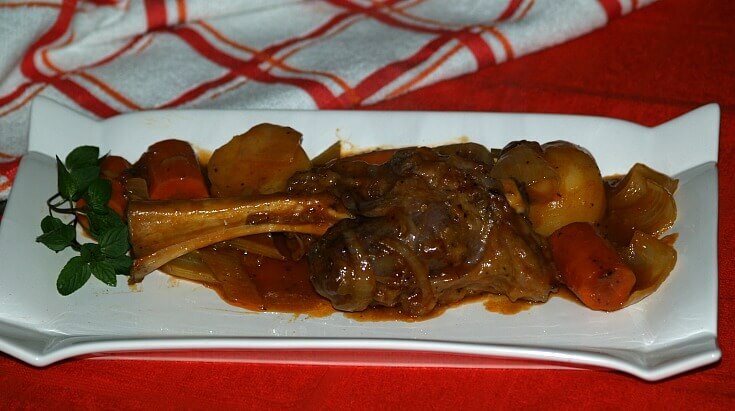 It is important to learn how to cook lamb shanks recipes to end up with a great quality dinner. This part of the lamb comes from the arm of the shoulder, contains a leg bone and part of the round shoulder bone. This part is covered by a very thin layer of fat and a thin paper like covering. Like every animals meat, there is part of the animal which produces tougher meat; this is the tough part of the leg of lamb. Most often this part has the most flavor and cooking it correctly brings out that flavor and produces a delicious dish. When learning how to cook lamb shanks recipes, you must realize that these not so tender cuts must be cooked slowly either by braising, baking or cooking in a slow cooker. Ingredients like lemon juice, vinegar and wine helps the tenderizing process. Herbs and spices help to bring out the delicious flavored by adding vegetables to the pot a delicious meal is the end result. This lamb shank recipe can be reworked by substituting your favorite spices for the ones in the recipe. It is a great family dinner recipe, recipe for entertaining or even dressed up with garnishes for the Easter menu. The nice thing about crock pot cooking is that you put it all together, turn it on and let it cook for several hours; you are free to do other things. In the end, you have a savory meal! Rub lamb with lemon juice; let stand for 10 minutes. Shake lamb in bag of flour with garlic seasoning. Sauté meat in oil until well browned on all sides; remove to a 4 quart casserole. Drain off all but 2 tablespoons fat; sauté onion and garlic in lamb drippings until tender. Stir in remaining seasoned flour and brown lightly. Combine consommé, ketchup, Worcestershire sauce, vinegar, brown sugar, dry mustard and bay leaf. Heat sauce mixture and stir until thickened; pour over meat in casserole. Scatter carrots, celery, onions and potatoes over and around meat. Cover and bake for 2 hours until meat is tender; baste two to three times during cooking. Uncover and cook 15 minutes longer. To cook in Crock pot follow same directions; place in Crock pot instead of casserole dish. Cover and cook on low 10 to 12 hours (on high 4 to 5 hours). 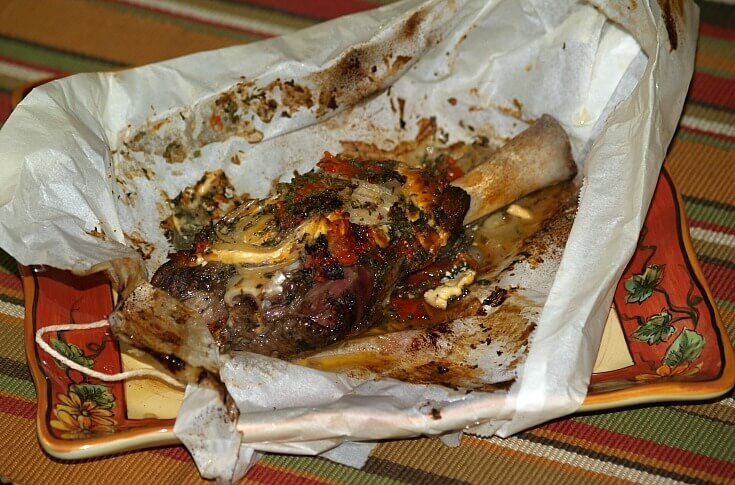 Learn how to cook lamb shanks in parchment paper that are tender and delicious. For ONE SERVING prepare each lamb shank as follows. Make several slits in the lamb shanks from top to bottom. Insert the slices of garlic in the slits. Tear off a piece of parchment paper big enough to wrap around the shank. Place the shank on the parchment paper; top with cheese slices. Arrange the onion slices and tomato on top of cheese. Sprinkle with herbs, lemon juice, salt and pepper; drizzle with oil. 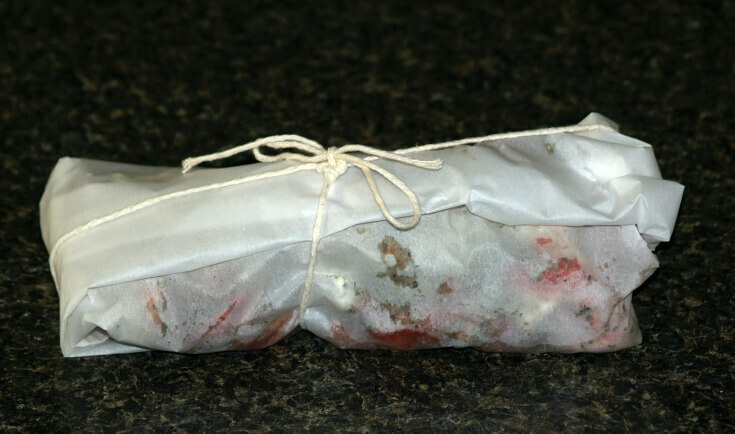 Wrap securely in the parchment paper; tie with string. Place wrapped lamb chops in a shallow baking dish. Bake about 1 ½ hours to 2 hours until tender done. Open parchment paper to serve; each 1 serving. This is a very flavorful dish when you learn how to cook lamb shanks. Grind cinnamon, cloves and allspice to a powder. Heat oil in a large skillet and brown lamb shanks on all sides. Transfer lamb shanks to a crock pot. Add onions to the skillet and toss until lightly browned. Add the spice mixture and the brandy to the onions and stir for a couple of minutes. Stir in the tomatoes and pour over lamb in the crock pot. This is a delicious way to learn how to cook lamb shanks. Cook shanks in hot oil in large skillet until browned; drain well. Add remaining ingredients to skillet; cover and cook over medium heat 1 to 1 ½ hours until tender. Add more water if needed to cook. Learn how to cook lamb shanks by roasting. Place lamb shanks in single layer in shallow baking dish. Sprinkle meat with salt, garlic and pepper on all sides. Bake for 1 hour (NO water added); baste each shank with 1 tablespoon wine. Bake 45 minutes longer; baste with 1 tablespoon wine. Bake remaining 15 minutes until tender done; serve with cooked rice. Learn how to cook lamb shanks for a complete meal for four. Wash shanks with fresh water; place in large Dutch oven. Cover shanks with the water; slowly bring to a boil over medium. Cook about 20 minutes; add rutabaga, carrots, leeks, salt and pepper. Return to a boil; reduce heat, cover and simmer 1 hour. Add the potatoes to Dutch oven; simmer for 20 minutes. Shred the green part of leeks; add with parsley to Dutch oven. Simmer for 5 minutes or until meat is tender. Remove meat and vegetables to large deep serving bowl or pan. Blend flour with 5 tablespoons of water until smooth. Stir flour mixture into cooking liquid; bring to a boil stirring constantly. Cook and stir sauce for 3 minutes; taste and adjust seasoning. Pour sauce over the meat and vegetables; serve hot. Grind cinnamon, cloves and allspice to a fine powder. Add shanks and brown on all sides 7 to 11 minutes. Using tongs transfer shanks to a slow cooker. Add onions to skillet; cook and stir until lightly browned. Add spice mixture and brandy. Cook and stir 2-3 minutes scraping bits from bottom of skillet. Pour over the lamb in slow cooker; cover pot. Cook on low heat until meat is very tender about 6-8 hours. Learn how to cook lamb shanks on polenta with Parmesan crust. Heat a little of the oil in a large iron skillet. Brown shanks two at a time about 5 minutes on each side. Place shanks in large roaster pan; repeat all shanks. Place lamb shanks in a single layer in roaster. Add carrots, onion, CHOPPED garlic, tomato paste and rosemary to the skillet. Stir and cook skillet mixture about 3 minutes; add wine and chicken stock. Bring mixture to a boil; pour over the roaster of lamb shanks. 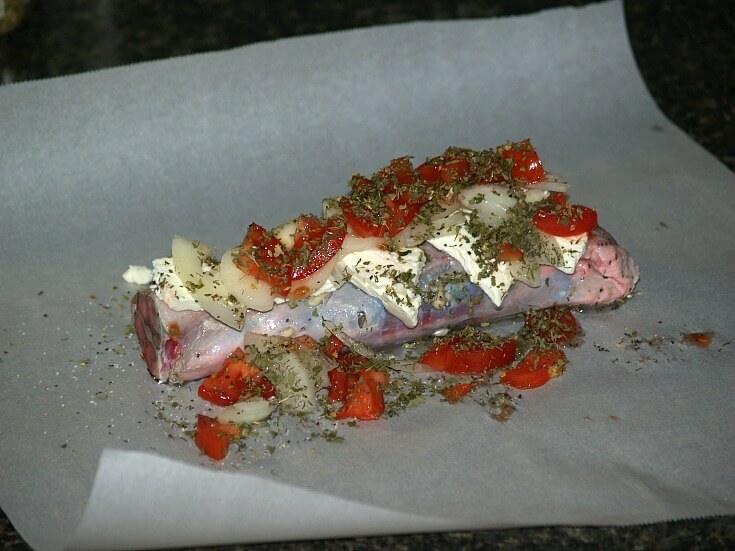 Cover and bake in oven 2 to 2 ½ hours until very tender. TO MAKE POLENTA bring 4 cups of the water to a boil in medium saucepan. In a bowl combine cornmeal with REMAINING 4 cups of warm water. Whisk salt and cornmeal mixture into boiling water until it begins to thicken. REDUCE HEAT TO LOW; stir vigorously and cook until polenta is creamy. NOTE: Cook over low about 2 hours stirring vigorously every 5 minutes. Remove from heat; stir in 2 tablespoons of butter and ¼ CUP of Parmesan. Season with salt and pepper; cover and keep warm. Melt REMAINING 1 tablespoon of butter and pour into a bowl. Add bread crumbs, shallot, parsley, MINCED garlic and REMAINING ¼ cup Parmesan. Season crumb mixture with salt and pepper. INCREASE OVEN temperature to 400F degrees. Spoon the polenta over a large oven proof serving platter. Arrange the lamb shanks on top of polenta; pour ¼ cup of pan juices over each shank. NOTE: Serve remaining juices with meal. Pat each shank with about ¼ cup of the Parmesan crumb mixture. Arrange the cooked vegetables around the shanks on platter. Place platter on TOP shelf of oven for 15 minutes until crumbs brown.